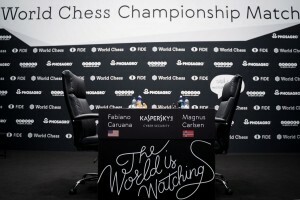 Caruana – Carlsen 2018 game 8 LIVE! The second possibility is Nc4 with 24. Nc4 g4 25. Qf2 f3 26. Rfe1 Rc8 27. gxf3 gxf3 28. Kh1 Bg6 29. Re6 Bf4 30. d6 Qg5 31. Ne5 Qg2+ 32. Qxg2 , but besides those Caruana has no other option on the plate. 20… Bf5 is acknowledgement for Carlsen that he has a bad position and needs active play, however, it is also a blunder increasing ever further Caruana’s advantage. Close to 1 hour advantage on the clock for Caruana suggests that Carlsen is well aware of the difficult position he got himself in. Lc0 pointed the difficulty after move 18 to have a good move. Carlsen tried to be active with …g5 and the immediate reply of Caruana showed that the Norwegian has gone right into Caruana’s home preparation. And Fabiano Caruana is spot on! With little hesitation he plays the critical line. And we have the first !boom of the game, Carlsen goes …g5 and engines do not like it at all. Lc0 is at +1,4 and SF 128 is at +0.52. Of course, Caruana has to find 19.c4 now, although g3 or Kh1 are also perfectly fine for keeping the advantage. The first move is 1.e4 by the guest of honor Demis Hassabis from Google Deep Mind’s Alpha Zero. Fabiano Caruana has the white pieces today. Will we see another theoretical battle in the Rossolimo variation? Or will Caruana try 1.d4 or 1.c4 to mix things up? 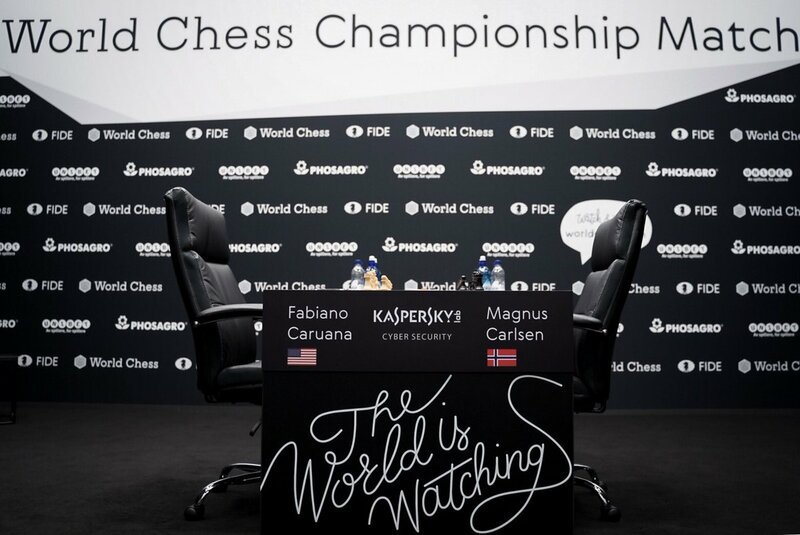 It is time for game 7 of the World Chess Championship 2018. After seven consecutive draws the audience is hungry for a win by any of the players. However, the stakes are high and it is less likely that players will take risks. A decisive result at any point from now on might very well mean the match is over.